Thermoelectric effects are a fundamental building block for the conception and development of new processes for information processing. They enable to re-use waste heat obtained in different processes for the operation of respective devices and thus contribute to the establishment of more energy-efficient, ecofriendly processes. A promising representative of this effect category is the so-called spin Seebeck effect, which became prominent within recent years. This effect allows to convert waste heat into spin currents and thereby to transport energy as well as information in magnetic, electrically insulating materials. Physicists of Johannes Gutenberg University Mainz (JGU) in Germany together with their colleagues from Glasgow University in Scotland now succeeded to reveal essential properties of this yet to be fully understood effect. Their findings contribute to a more thorough understanding of the underlying processes of this effect and thereby support its further development for first applications. The research work has been published in the journal Physical Review X. 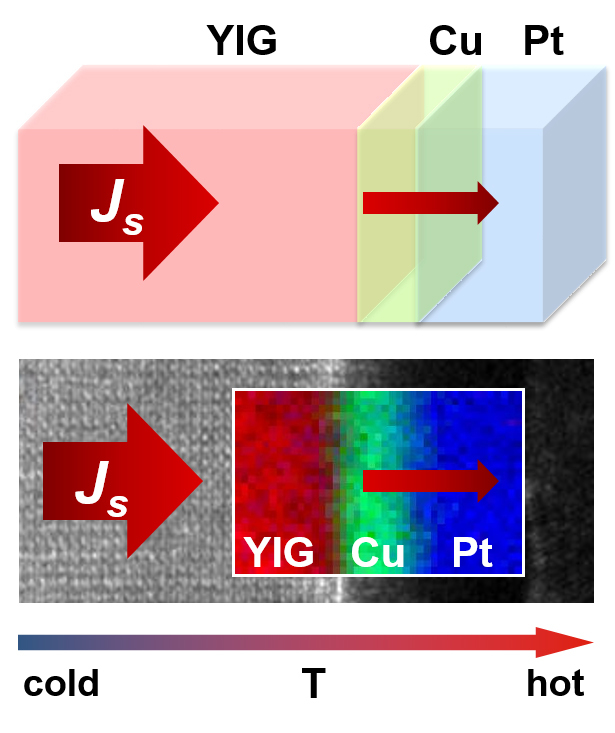 The spin Seebeck effect belongs to the category of spin-thermoelectric effects. Previous work of the physicists at Mainz University in collaboration with colleagues from the University of Konstanz and the Massachusetts Institute of Technology (MIT) has shown that the creation of a thermal non-equilibrium leads to the creation of magnetic waves, so-called magnons, within magnetic materials. These transport both energy and torque and thus are able to induce a voltage signal in adjacent metal thin films. By means of material-dependent measurements over a wide temperature range and with a varied thickness of the employed magnetic material, a direct correlation between the amplitude of the voltage signal and the intrinsic properties of magnons was identified. Furthermore, it was shown that the temperature dependence of the voltage generation efficiency additionally depends strongly on the atomic structure of the interface between magnetic material and metal thin film. "Step by step answers to the open questions about the fundamental processes of the spin Seebeck effect are given. Our results yield an essential contribution for the development of the aspiring field of magnon spintronics", said Joel Cramer, co-author of the publication and PhD student at the Graduate School of Excellence Materials Science in Mainz (MAINZ). Professor Mathias Kläui added: "I am very glad that by means of the intensive collaboration with our colleagues we were able to correlate the transport of spins with the microscopic, atomistic structure. The cooperation with our colleagues from Glasgow already led to several mutual publications and an active exchange with leading groups from abroad is one of the central measures of our Graduate School of Excellence." Establishment of the MAINZ Graduate School was approved through the Excellence Initiative by the German Federal and State Governments to Promote Science and Research at German Universities in 2007 and its funding was extended in the second round in 2012. It consists of work groups from Johannes Gutenberg University Mainz, TU Kaiserslautern, and the Max Planck Institute for Polymer Research in Mainz. One of its focal research areas is spintronics, where cooperation with leading international partners plays an important role. Thermally excited spin waves carry a spin current from the ferromagnet (YIG in this case) into the metal layer. Depending on the YIG thickness and the interface condition the amplitude of the spin current as well as transmission properties change.